B.J. Hollars, In Defense of Monsters, Origami Zoo Press, 2011. "This thoughtful collection of essays explores the facts surrounding three monsters that have plagued and intrigued our modern society with the idea of their mere existence. They contradict everything we know, and yet, we can’t dismiss their stories. Against reason and science, we can’t help but hope they might not, not exist." "The founders of Origami Zoo Press, publisher of B.J. Hollars’s latest collection of essays, state in no uncertain terms that they “want to exhibit absurdities of the world, whether it’s done by bending genres or simply illuminating the bizarre details of everyday life.” With the publication of In Defense of Monsters, a chapbook that mixes half-narrative-half-analytical essays with theses buoying the existence of Sasquatch and Nessie the Loch Ness Monster, Origami Zoo has found a way to exhibit every type of absurdity they could hope for. Hollars is unwavering in his convictions, and they’re not at all illegitimate ones. After all, he’s not arguing that the creatures of our modern folklore are necessarily right around the corner. Instead, his essays are each themselves a question: why not this? Why, if no definitive proof sways us to either side of the debate, do we opt for non-belief in lieu of what may very well be? In these 34 pages, we can defend what ultimately might be less impossible than we think. Of the 10,000,000 plants and animals assumed to exist, we recognize fewer than two million, confirming a difficult fact — the unknown far outweighs the known. Hollars knows that his audience is going to need cold, hard facts to turn their heads in the direction of his conceit. Such facts he provides in abundance, with a gusto that suggests every bit of research was an emphatic personal quest as much as anything else. The chronology of each legend is laid out in a way that sates any immediate suspicion: Sasquatch, for example, is a persistent and geographically variant folktale, with sightings all around the globe and across centuries, so at best we can call all these cultures honestly (and collectively) mistaken about what they saw, rather than hungry for a hoax. Similar implications are scattered throughout the collection, and Hollars’s approach is charming no matter what side of belief you find yourself on. Our speaker is careful and precise in the way he distills his monsters: the presentation of these facts is not converting us to the religion of Bigfoot, Nessie, and the Beast of Busco. The presentation of these facts chips away instead at our steadfast ability to declare any unseen thing untrue. their] population was believed to be somewhere around 50,000, though after researchers hiked just fifty miles off the nearest road, they were greeted by a gorilla-filled landscape…if 125,000 lowland gorillas can live just fifty miles from Africa’s nearest road, what might be hiding in rural America? Passages like these carry a subtle desperation to them, a strain to ignite our more fantastic imaginations. The best part is, there’s no way to prove him wrong. "Most people have little room for magic or legend in their lives. Folks spend most of their formative years cultivating a certain amount of cynicism towards legend and work incessantly towards creating a sense of control over themselves and the world at large. To be human is to conquer – whether physically or mentally. We have morphed into cynical, secular creatures, and created a Western reality built on entertainment that recreates old legends and story lines but without the danger of immediacy (or, some might argue, a moral base that unifies us. We rarely look towards scripture, myth or legend as a moral barometer, nor use these stories as allegorical lessons which we may benefit from) that the legends of old seemed to conjure. Or maybe, I’m cynical. But even with this so-called control we believe we possess, we still have a surprisingly large amount of gullibility built into our being. Let’s turn our focus to some modern hood-winkery – the alleged boy in the balloon of 2009 – as an example. Father calls media attention to the fact his son is in the balloon. New cameras and federal agents follow balloon. Balloon is empty when it lands. Someone saw an object drop from the balloon. Boy is found in home attic. Father is sent to jail for 90 days and ordered to pay $36,000. This modern tale of Icarus (a boy flying too close to the sun) made the world privy to a suffering we could conjure. This story, so heart-rending, compelled us to imagine a world outside our own. Each of us became a father who lost his son to a balloon flying in the heavens. It is a study in human behavior, a textbook case, that when the incident was found out to be nothing more than hot air (excuse the pun) the father was nominated monster of the year. Not because of the way he fooled police, interviewers, and federal agents, but because he fooled us. And like a monster, we forgot him and the story that brought us all together as if we were somehow abused and had to hide the memory away. We returned to our individual bubbles a little more wary and said to ourselves that next time, in no way, would we be so gullible. Our need to prove that we’re in control is at odds with how easily we can be led astray. In a way, we want to believe. But, with hubris, we attempt to create a world that will bend to our will. Yet we ignore the faults that indicate we’re not 100 percent in control. So skepticism and hubris remain in a constant balancing act. How do we give equal weight to each? More importantly, have we given up something by attempting to expel wonder from our existence? In response to these questions, BJ Hollars – in his new book of essays In Defense of Monsters – argues that on the one hand, re-imagining legend (using the Sasquatch, a gigantic turtle living in a pond, and the monster of Loch Ness as an example) may help us utilize cynicism effectively. But with the scales balanced he warns that on the other hand, giving into imaginary creatures may, ultimately, lead us to distraction. Hollars is quick to insist that in reality the Sasquatch existed in the form of the Gigantopithecus, a large land ape that came over on the Bering Land Bridge some 300,000 years ago. To further emphasis this point of validation, Hollars points to the 18,225 new species of animals discovered in 2008 alone, a quarter of which were mammals. Although none of the mammals were as large as a Sasquatch, similar sized – if not larger animals – were discovered in the past. Do these discoveries allow us the possibility that we may have given up too early on Big Foot? The effect here is a blow of sorts; Hollars is asking you, before anything else, to consider the existence of the monster and put your cynicism on the back burner, if only till the end of the book. Hollars suggests that the problem may lie in our hubris: to accept the legend of the Sasquatch is to give in to the idea that we’re wrong. This admittance would require a giving up of control. The fact that the Sasquatch bridges the gap between the human and the lowly ape may be another reason for our hesitation to admit its existence. The Sasquatch, unlike other monsters, is anthropomorphic, and is therefore all the more frightening. The legend of the “Shelled Sasquatch,” a large turtle found in a pond in rural Indiana, serves as another reminder that monsters may lurk directly below the surface of modern reality. The turtle offered travelers and tourists the chance of discovery, of hope, and a reopening of the imagination. In this way, the monster became interchangeable with God by giving us a glimpse of the unknown, where nature and the mysteries of the universe intermingle. The “Shelled Sasquatch” is also a tale of warning; Although Hollars suggests that we should, on occasion, give in to the allure of the monster as a mind expansion exercise, he also warns of the danger we face when giving faith the monster’s legend. He points to the destruction of the pond and the surrounding land from the footfall of monster tourists hoping for a glimpse of the monster, as a reminder that in the mad hunt for the unknown, for the answers to a false reality, a perfectly good reality was ruined. Hollars suggests that the search for monsters take us away from another task of great importance: that of serving our fellow man. In his essay on the Loch Ness Monster, Hollars is incredulous of the laws made to protect a monster that has shown little desire to be discovered. Harming Nessie, in any way, was made illegal by the Scotland Secretary of State, Sir Godfrey Collins in 1938. This, Hollars writes, was at the same time millions of Jews were being shipped by train to their deaths, much to the blind/turned eye of a European populous. Earlier in the book, Hollars states that the Sasquatch may be the fittest of all of Darwin’s creatures because the Sasquatch has the good notion to stay hidden away from us and the unfriendly world we choose to live in. Maybe it isn’t that we choose to exist in a cynical reality. Maybe the focus of our cynicism is misplaced. 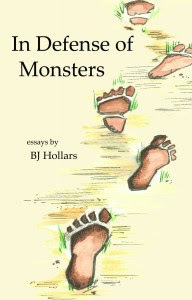 Although this book may be at first glance about defending the existence of monsters, BJ Hollars makes an even grander argument for humankind’s penchant for shortsightedness and our ability to give into one idea without broad reflection. To give up the idea of the monster is to also give up ourselves: because without monsters we lack the imagination for a bigger world. To accept the monster, however, we give into a world which negates reality. "Astrophysicists work to uncover a Theory of Everything, the mathematical equation of all life in the universe. Religious zealots describe heaven and hell in florid detail. Tarot cards, constellations, the all-mighty Google. In our search for certainty, whether through belief, proof, or a near-perfect search engine, what is the value of choosing not to know? In his newly-released nonfiction chapbook, In Defense of Monsters, B.J. Hollars chooses his words carefully when he challenges readers to consider that infamous creatures such as Sasquatch and the Loch Ness monster “may not not exist.” The use of the double negative is deliberate, a strategy employed throughout the collection meant to distinguish Hollars’ challenge from demanding empirical proof. Instead, Hollars relishes the possibilities of such existences, backed by meticulous scientific and field research, while simultaneously exploring a wilder, more sinister proposition in the face of humanity’s fact-hunger: that what we call elusive may be choosing to elude us. Chapbooks allow writers of all status some welcomed literary flex. Because they tend to be the domain of small, independent presses like Origami Zoo, chapbooks capitalize on limited print runs and e-book formats, which give both writer and publisher greater freedom to experiment with content and form. While many emerging writers use chapbooks to begin compiling or excerpting longer work to test in the literary market, other chapbooks deliberately function within the abbreviated form. They contain wholly developed ideas that operate singularly, and not as a sneak preview of something yet to come. In Defense of Monsters has such an identity in its three heavily-sourced essays, complete with Works Cited pages in proper MLA style. Content and form are healthily symbiotic here, as Hollars has written something closer to a political pamphlet a la Thomas Paine, meant for concentrated circulation, meant to stir something up in those lucky enough to obtain a precious copy. As I read these classically-inspired essays–two out of three using the “In Defense Of” structure–I imagined some cloaked figure thrusting tattered pages into my hands, part of some Lutheran-esque underground effort towards reform. Each of Hollars’ essays “defends” a different monster, beginning with the familiar Sasquatch (a.k.a. Bigfoot), then moving to the lesser-known Beast of ‘Busco (a giant turtle said to reside in Indiana), and finally returning to the familiar with the Loch Ness monster of Scotland. Yet with each categorized defense using a variety of archeological, biological, historical, and anecdotal evidence to support the creatures’ possible existence, Hollars reveals more about the species who indisputably does: us. And it is our existence that receives both the most tender and critical of Hollars’ analysis. But “searching” takes on a complicated meaning in the two subsequent essays of the collection, for Hollars understands that humanity too often exploits what it finds. And in such exploitation, Hollars identifies the costs both to the mysterious species we seek and to the humans obsessed with them. Hollars’ literary game of “hide-and-go-seek” takes us next to Churubusco, Indiana in “Sasquatch in a Shell.” In 1949, Oscar the oversized turtle, better known as the Beast of ‘Busco, made his first appearance in Fulks Lake, spotted by local farmer Gail Harris. As the hype grew with other sightings, Churubusco briefly enjoyed the kind of novelty that comes with any World’s Biggest designation, capitalizing on Oscar’s presence in every conceivable way–Oscar burgers at Pat’s Café, an insurance company’s turtle-y new slogan, and the annual Turtle Days festival still held today. Indeed it is not without import that the accounts of the giant saurians, which in our youth would have been grand copy, are today relegated to inside pages. The competition is too keen for natural monstrosities. The real issue, moreover, is not so much what we think of the sea serpents, but what they think of us…What has this legendary animal risen from the dawn period of racial memory at just this time? Hollars, like the Washington Post, is keen to place the discoveries of humankind in historical context. In this case, the rise of the Nazi party in Germany was poised to enact a terrible plan on its own species at the same time that Jim Crow laws in the United States “preferred the rope.” And while Scotland drew up legislation to protect what may lay hidden in fog-laden Loch Ness, Hollars wonders “who protected European Jews or African-Americans in the South?” The theory posed in the book’s final lines do what all resounding literature does, suggesting something surprising, yet inevitable. In this case, Hollars leads the reader to a frightening precipice in his once-playful argument. In the long view, which looks back as well as ahead, Hollars can imagine that humankind’s control issues could become our evolutionary Achilles heel. "BJ Hollars likes tea. All kinds of tea. Has one entire kitchen cupboard jammed full of chamomile and green and white and Sleepy Time and citrus and black teas — and he’s really nice about sharing. It must be the tea that makes him one of the hardest working writers I have ever met. He rises at five in the morning to get started before his computer, then heads to campus to teach a full course load, then gets home to edit one of three anthologies, work on a novel, edit a few short stories, finish his grading¬ — and he still somehow finds time to visit the gym, walk the dog, watch reruns of his favorite TV shows, and throw the occasional backyard barbeque. Oh, and his first child is due any day now. Hollars is also one of the most humble, happy, and approachable writers I have ever met. Maybe it’s the tea. Assistant professor of creative writing at the University of Wisconsin-Eau Claire, Hollars is the author of Thirteen Loops: Race, Violence and the Last Lynching in America and is at work on another Alabama-themed book of nonfiction. He is also the editor of You Must Be This Tall To Ride (Writer’s Digest Books, 2009), Monsters: A Collection of Literary Sightings (Pressgang, 2012) and Blurring the Boundaries: Explorations to the Fringes of Nonfiction (University of Nebraska Press, 2012). His writings can be found, well, all over the place: North American Review, American Short Fiction online, Barrelhouse, Mid-American Review, Fugue, Faultline, The Southest Review, DIAGRAM, Hayden’s Ferry Review, Puerto del Sol, Hobart, among others. I recently caught up with him over a virtual cup of tea to ask a few questions about his most recent work, a chapbook entitled In Defense of Monsters published by Origami Zoo Press. Congrats on your new chapbook, In Defense of Monsters. I remember when you began this project, it was partly meant to demonstrate to a group of composition students that a case can be made for anything whatsoever — even Bigfoot — if one can write a strong enough argument. I recognize in these essays lessons I would teach my own students: how to use a counter-argument to strengthen a claim, how to introduce research with a signal phrase, etc. When did your chapbook’s opening essay, “In Defense of Sasquatch” stop being a teacher’s experiment and start taking on a life of its own? - That’s a really great question, and to be honest, I’m not sure when it expanded beyond the classroom. Sasquatch simply held me hostage, would not let me go until I’d proved him back into existence. It was funny, wandering the University of Alabama’s Gorgas Library in search of proof of Sasquatch. I left that library with a two foot tall stack of Sasquatch books, but none of them got me much closer to the truth. When I stumbled upon Arizona State University’s “The State of Observed Species Report,” I think the essay began to gain traction. The report kept careful count of the number of species that vanish and are discovered each year, and the fluctuation of species was simply startling to me. Sasquatch no longer seemed like such an impossibility given the thousands of other species that emerge from the wilds each and every year. Your essays ask us to question the moment logic took over imagination and disallowed us to believe in monsters. The narrator is persistent in this respect, heaping eyewitness accounts upon legends upon history upon statistical representations of otherwise unbelievable claims proved fact. Outwardly, the narrator presents a logical argument for the existence of monsters. Why was it important to you to make a valid case for these monsters? - I often fear humankind is too quick to lump all of the “unknowns” into the realm of impossibilities. It’s simply easier for the human mind to conceive of a reality it’s more comfortable with. Thomas Jefferson is a great example of a scientific mind willing to dream beyond the stifling boundaries of “scientific certainties.” In 1796, Jefferson examined some unknown bones and dreamed them into a giant American lion. They actually belonged to a giant ground sloth, though this wouldn’t be made clear for many years. I’ve always admired Jefferson for his ability to see the world differently, even when he was wrong. He didn’t view America as a land of limitations, but rather, a place of possibilities. Sounds like your next project should be about Jefferson! So, your narrator believes in monsters — or wants, at the very least, for us readers to entertain the idea of their existence. But let’s assume the narrator’s voice and the author’s voice are not one in the same. On some level, don’t you-as-author need to jerry-rig the essays in order for the stories to come alive in their most successful ways? - Ha. Perhaps jerry-rigging is the proper phrase for what I’m trying to do. Do I take some liberties of logic? You bet. But what makes these essays unique (I hope), is that they’re wholly grounded in scientific fact. I try to rely less on fringe science and moreso on national studies, such as ASU’s “The State of Observed Species Report” mentioned above. I try to keep an open-mind in order to pry the reader’s mind open as well. One can certaintly challenge my conclusions, but its far more difficult to refute the facts. This is why I’m careful to include a Works Cited page at the end of each essay. I want the reader to see what I see. A few notable writers have written mock-essays in the past — I’m thinking of Jorge Luis Borges in Labyrinths, or even your mentor’s book Michael Martone by Michael Martone — stories that the turn the idea of fiction on its head by posing themselves as nonfiction. Are you interested in this overlap? What is the appeal of writing a fictional piece posing as nonfiction? - Good question, and I suppose the answer to it is rooted in the assumption that I consider these essays fictional. I’m not sure I do. I’m quite familiar with many fictional forms that pose as nonfiction (the literary equivalent of a wolf in sheep’s clothing, perhaps, though far less menacing), but I’m not sure that’s what I intended to do with these essays. I really am trying to talk straight about monsters, but, as you mention above, I’m simultaneously employing the vehicle of “monsters” to talk about imagination as well. There’s a link — however precarious — between monsters and the extinction of imagination. To write off monsters like Sasquatch and Nessie is one more giant leap down an already constricting pathway. I think imagination is paramont to creativity and maybe monsters play a role here, too. Why not let them be the cure to an ordinary life? We need to be capable of dreaming of Bigfoot prints in order to find our way back to a pathway of imagination. You’re a fan of monsters. You’ve gone to a Bigfoot convention or two, perhaps in the same way Trekkies and Gamers go to their respective functions, or perhaps more for research — but I don’t think you came back cynical, in an informant sort of way. In fact, you seemed sympathetic. Are you? Do you think these convention attendees need essays like yours to exist? - Another great question, and you’re right — I did come back from the Bigfoot Conference quite sympathetic to my fellow Squatches. This sympathy, I think, came as a result of my understanding that the people who attend Bigfoot conferences are not necessarily die-hard believers as I’d assumed. In fact, the people in attendence were far more skeptical than I imagined. Most of the conference’s presentations were grounded in science, and many of the debates revolved around what form of science might best prove or disprove the case for Bigfoot. I recently shared my chapbook with a few of my friends in the Bigfoot world, and I’m still waiting for a reaction. Squatchers are quite protective of Bigfoot; they’ve grown weary of the world thinking they’re crazy for even considering the possibility that a 600-pound hairy beast may, in fact, roam the wilds of America. I’m not sure if they “need,” my defenses of monsters, but I like to think of myself as an ally to their cause. But in the end, monsters are only the half of it. I’m defending imagination as well.